In India, Pongal is a very famous festival. It is called farmer's festival or harvest festival. It is celebrated for 4 days in the mid of January every year. During this festival they make a special food called 'Pongal'. Yes! this food is named after the Pongal festival. It is mainly prepared with Raw Rice and Moong Dal. This food is a very tasty and a high calorie food. You can have this food for breakfast or Lunch. Though it is usually prepared during Pongal festival, you can also prepare this for Mother's day. Why not? Our Mother is special and she deserves this. You can surprise her with is food for this year's mother's day. 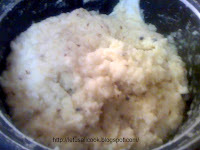 This is the easiest way of making Pongal and I personally follow this below method. Wash the rice and moong dal. Mix them together and cook them in Rice cooker with required amount of water. After it is done, in a pan add ghee and fry the curry leaves, ginger, pepper corn and Cumin seeds. Add this to the cooked mixture and mix well. Now fry the cashew in ghee and mix it well. Add the required amount of salt in 1/4 cup of water.Wait till the salt is dissolved. Mix this salt water to the cooked mixture and ta da! Pongal is ready! Serve hot. You can also do pongal in another way. In a pressure cooker, add some ghee/butter and fry all the ingredients except rice and moong dal. Now add the rice and moong dal along with required amount of water and salt. Pressure cook it for 6 to 7 hisses. Serve hot! P.S: Do not open the pressure cooker immediately. Wait for the pressure to be released and then you can open it. Pongal goes well with coconut chutney or eggplant gotsu (a gravy) or even with sugar. zlamushka, ya this food is a high calorie food. If you want you can also substitue ghee/butter with oil.But then the taste wont be so good. I personally use 1/2 cup of butter as I do this recipe very often.